In 2009, in the wake of the global financial crisis of 2007-2008, a process of reform began to improve how government agencies go about procurement. At first the focus was on reducing the cost of the goods and services that were purchased most often. Then, in 2012, the role of procurement functional leader was introduced – a role that gave the Chief Executive of the Ministry of Business, Innovation and Employment (MBIE) the oversight to make further improvements. When we introduced our work programme on procurement, we estimated that total government procurement spending was about $42 billion every year. This spending sees commercial suppliers and non-government agencies deliver goods, services, and capital works to and for government agencies. These can include health, education, justice, and social services, and supplies that keep hospitals, schools, and government agencies running, such as medical and office supplies. Understandably, it’s of importance to us all that this money is spent carefully and well. The procurement functional leader is one of five such appointments at this time, sitting alongside the functional leads for property, data stewardship, digital, and health and safety. Generally, the functional leadership approach aims to achieve significant change across the government. In Cabinet papers, Ministers recognised that the procurement functional leader could not make the needed changes alone and that support would be needed from central agencies and government agencies. We had planned to do two audits of MBIE’s procurement functional leadership, but after some initial work and consultation, we have decided to proceed with a single audit focused on whether the procurement functional leadership system is generating improvements in government procurement. We expect to publish a report on our findings and conclusions later in the year. What organisations make up the system for improving government procurement? The State Services Commissioner, who has delegated the role of procurement functional leader to MBIE’s chief executive. The New Zealand Government Procurement and Property Group, a business unit within MBIE. Broadly, the procurement functional leader is to provide support to agencies to improve their procurement capability and practices. MBIE is expected to engage collaboratively with agencies and chief executives of the agencies are expected to respond. Government agencies’ chief executives, who are responsible for procurement within their organisations or in collaboration with other agencies. In total, about 135 agencies must use the government procurement policy framework, which is made up of principles, rules, and guidance. Other government agencies, including local government, ought to use the framework because it represents good practice. Commercial suppliers and non-government organisations. Who is involved in our audit? Our main focus is MBIE and the New Zealand Government Procurement and Property Group, but we’ll also examine how central agencies have supported MBIE’s change management role. We’ve picked six agencies of different sizes to understand how MBIE has supported them to improve procurement within their organisations. These agencies are the Ministry of Social Development, Fire and Emergency New Zealand, the Ministry of Foreign Affairs and Trade, the Ministry for Culture and Heritage, the New Zealand Antarctic Institute, and the Ministry of Education. We’ll also meet with representatives of third parties to government agencies. As needed, we’ll make recommendations aimed at further improving procurement and value for money when we publish our report later in 2019. 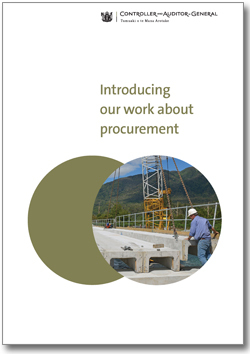 In the meantime, we’ll be writing more blog posts about our work on procurement as we go – keep an eye out for them here, or sign up for our mailing list for notifications when we publish new reports. Note: we updated this blog post on 27 February 2019 to include the Ministry of Education as one of the six agencies involved in our audit.